All right, the magic amigos at MAK MAGIC are at it again. This time we took aim at the coin guys and gals. BROKE is an entertaining and amazing coin effect that will break your audience up as you talk about meeting a guy who was down on his luck, a juggler… kidding here. Anyway, he is down to his last quarter, broke, the quarter, not the guy. 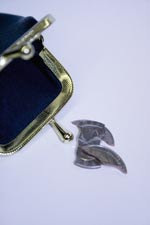 You produce a coin purse from which you dump out pieces of a broken quarter. After some a great story telling and some fun poking at the US Mint and the federal budget, you guessed it, you repair the broken coin. This is something you can carry anywhere, perform surrounded and end up, wait for it…CLEAN. Let me repeat that last bit. You end up CLEAN! This is a great effect for table-hopper, strollers, close-up artists and coin folk. We give this one three red hats! Red hats…our logo… Come on work with me here. 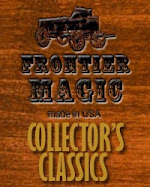 Frontier Magic gets the point! A New Magic Frontier at MAK!